You and your wife were captured by demons! You have been trapped in a dungeon for a thousand years asleep... You wake up trapped in cell, grab your weapon and begin the quest to find your wife begin! 42 mini-game levels - cursor keys + space bar - are you ready for Cursor Chaos!? 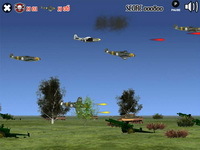 Fly a P51 Mustang or a Supermarine Spitfire fighter plane and destroy the German Luftwaffe with your three favorite wing-men! 18 distinctive missions to complete. Comprehensive upgrade shop. Unlock new missions or return to old favorites to upgrade further. Obtain ferocious levels of power as you weave a deadly dance of death in the skies! Delve into deep dungeons and emerge with a pack full of loot, defend the kingdom with the help of your personal companions or spend your time by the forge crafting artifacts of great power. Thrown head first into the raging conflict between heaven and hell you must choose a side and forever change the fate of the world. Tactical Zombie Outbreak Simulator. Can you lead your squad out of the infected zone? Are you a good commander? Can you take the good decisions? Will you hold the line or will you take assault in a blaze of glory? Find out now! Guide Lola past hordes of undead zombie hookers to collect weapons and cash AND guide your still-living clients back to your trailer for a little business. Fulfill the night’s quota, hop in your trailer and do it again the next night. Basically snake for two people! Great and addictive game. This is the game where you control a little cycle that builds a wall after itself. Try to out maneuver your opponent so that he or she runs into a wall before you do. The cycles can go up, down, left, and righ Each cycle also has 3 turbos which allow you an extra burst of speed. When you play the computer, you have to be 6 levels of increasing difliculfy to win it all. Blast your way through the autumn forest crushing enemies and stacking combos! Combos of GREAT MAGNITUDE! The dark creatures of the deep forest are gathering in hordes... Don't go down without a FIGHT! Samurai Autumn is a running action/platformer featuring 12 stages, 4 boss battles and upgrades! Stack combos by jumping on multiple enemies in succession. Power your blade with Sun Flowers and unleash a furious storm of energy blasts. Through 5 scenarios, the Knight seeks his stolen love, imprisoned by the Devil himself. Showcasing a new spin (literally) on the puzzle RPG genre, you must guide your Knight to each level's exit by drilling away the blocks he stands on, and letting gravity take effect! By rotating the entire game board, you can guide him anywhere you wish; into confrontations with the monsters that dwell in the dungeons, or to greedily grab the treasures that litter the game - be careful not to run out of stamina, though! Collect enough currency, and you can buy potions, spells, armour and other trinkets from a shop staffed by a helpful fairy. 3 skill levels cater for absolute beginners, right up to the most hardened strategy fan, 2 different game modes provide essential replayability and a host of achievements await the completist! You've played this game before. Haven't you? - A new twist on the paddle and ball game. Start with 3 paddles and one ball and try to keep the ball from falling off screen. As time goes on the amount of paddles and balls will increase and so will your score. After you lose spend your score on upgrades and try again.